Workplace English language training programs represent a corporate investment in language skills enhancement and human capital development. 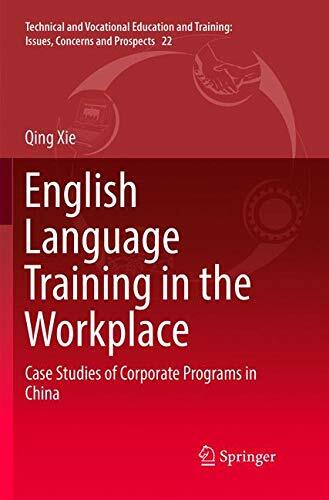 This book evaluates English language training programs in Chinese workplaces by examining a range of training effectiveness variables and identifying the factors that facilitate or hinder effective learning outcomes for workplace English training programs and explores the potential benefits of these programs. This book will benefit both companies that are developing their training and development strategies and private training organizations that are developing training programs for particular industry and business needs. It will also be an excellent resource for learners who are seeking business English communication skills opportunities and trainers who are refining their workplace teaching practice. This book reiterates the significance of business English communication skills development programs in terms of the benefits to economic globalization, human capital development, employability, sustainable livelihoods, and lifelong learning in China. Having conducted a policy evaluation at both the national and local levels, this book also informs policy stipulation for corporate employee language training schemes. Although this book primarily examines corporate experience in China, the findings and recommendations will have important implications for other countries in Asia and worldwide.